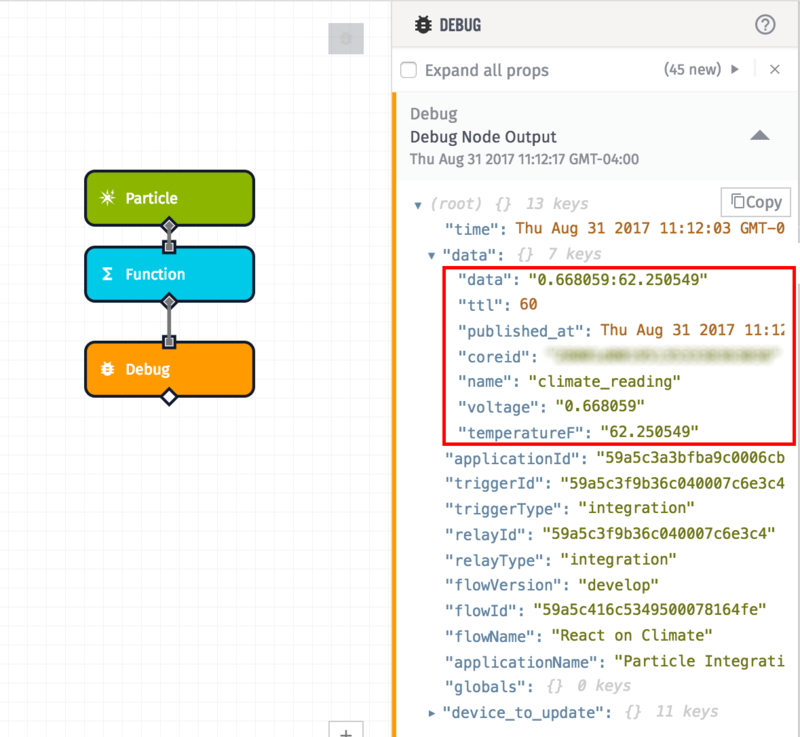 to make it easy to connect a Particle device to our platform to build real-time connected solutions. 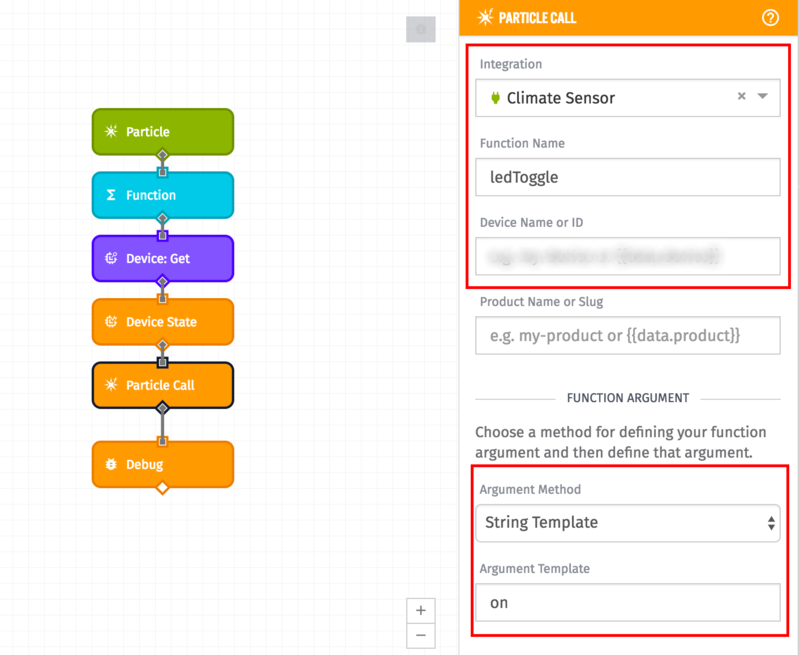 This is a quick reference on how to connect Particle with the Losant IoT Platform. 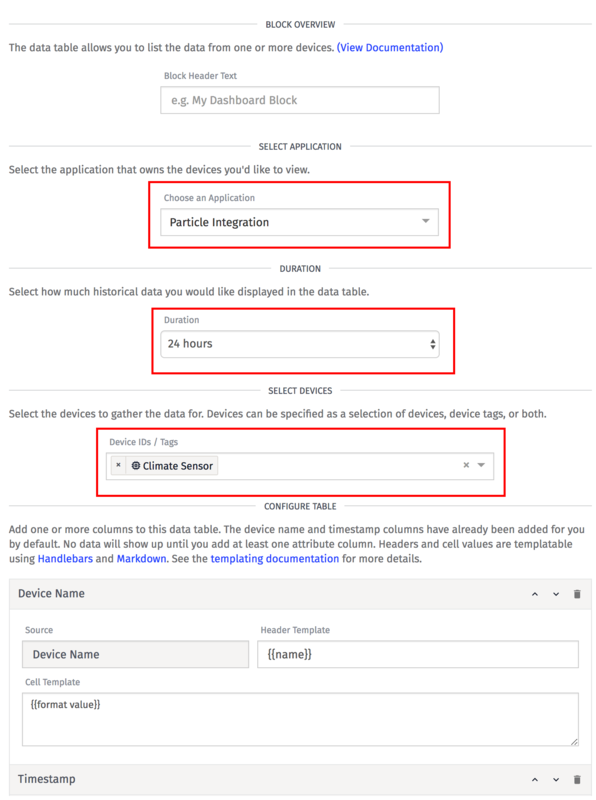 Set up a Particle account, register a Particle device, and have knowledge of flashing a Particle device. For details, check out this site. Have a Losant account. If you do not have one, you can create an account here. Look at line 19. You’ll see the Particle.publish method being called. This triggers a Particle Event named “climate_reading” with the voltage and temperature. To save resources, notice that we are sending twopieces of data in one call with a “:” as a delimiter. Next, we’ll create an integration in Losant that can listen for these events to trigger a workflow. 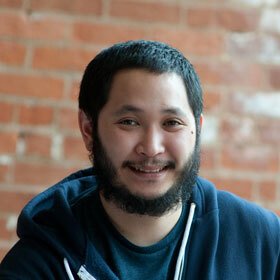 In that workflow, we’ll parse the data. Let’s create an integration next. Integrations are connections to external MQTT brokers, Pub/Sub messaging suppliers, or other third-party web services. These connections can then be used to trigger workflows and output messages from your application. 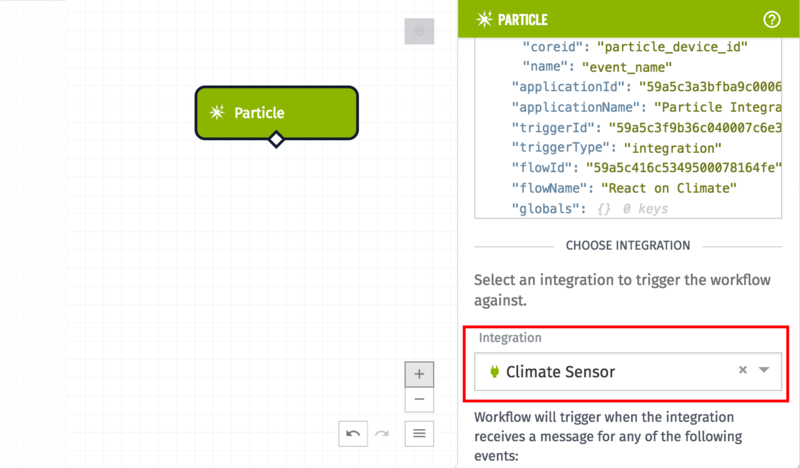 In this case, we are using the Particle integration to trigger a workflow every time the “climate_reading” event is published. Click on “Integrations” in main application menu, then click on “Add Integration”. 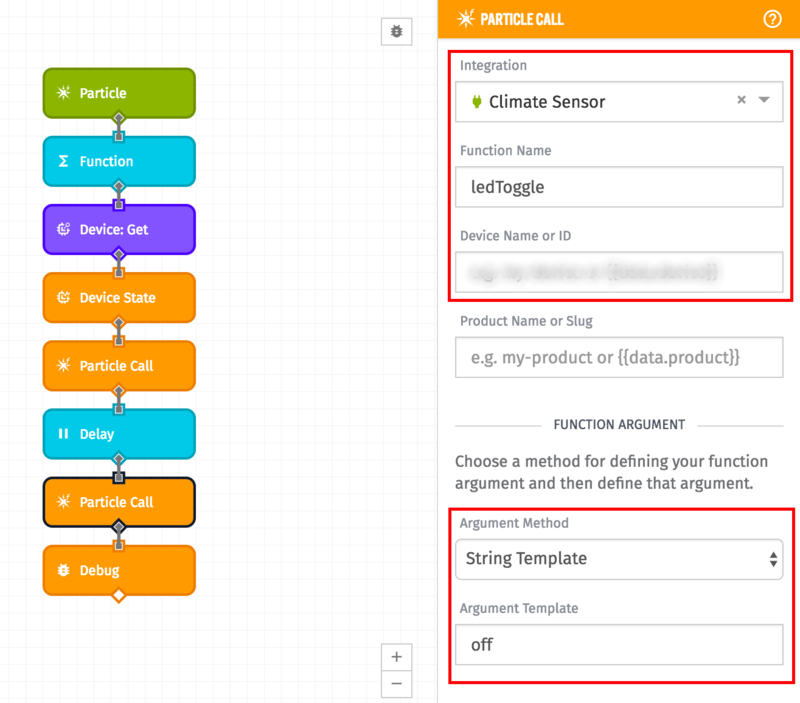 Give your integration a name like “Climate Sensor”. Select “Particle” from the “Integration Type”. 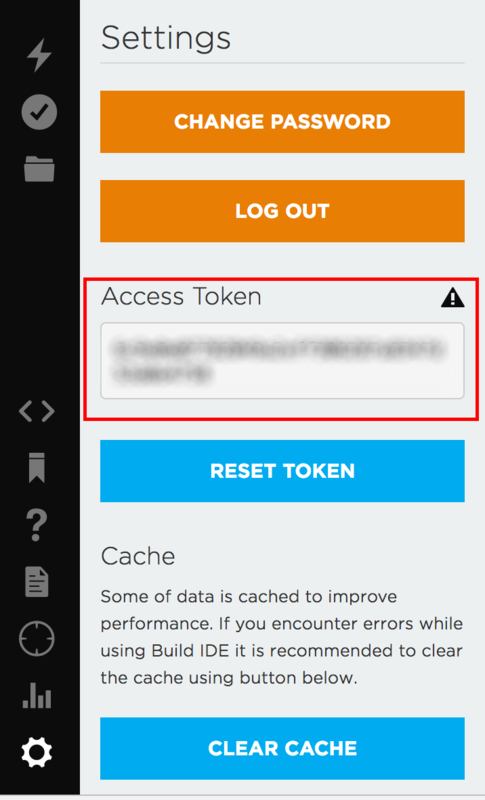 Set Access Token from Particle. 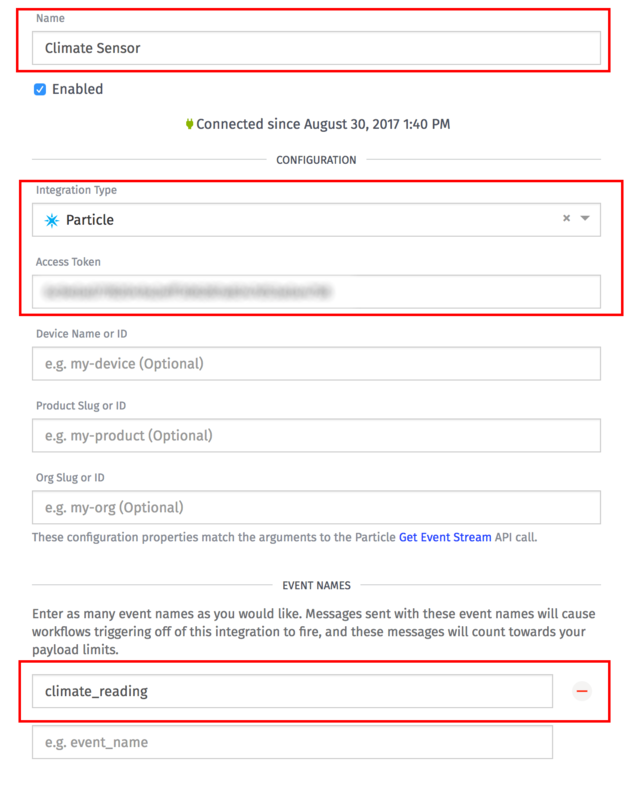 Set the Event Name to “climate_reading”. 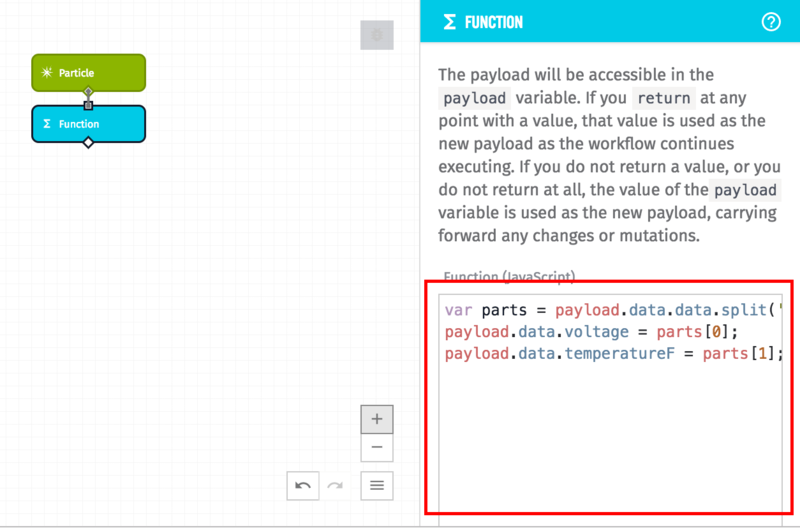 This will trigger the workflow when the “climate_reading” event is triggered from a Particle device. Let’s create a workflow inside Losant. Now, we will drag the Particle node onto the canvas. Select the Integration that you just created. That code parses the data in the Particle event and adds it back onto the payload. Next, drag a Debug node to the canvas and connect it to the Function node. Then, deploy your workflow. If your Particle device is running, you should be able to see the data coming into the Debug panel. If you want to store the device state, you’ll need to create a device in Losant to track the state of your Particle board. In the main application menu, click on “Devices” -> “Add Device”, then click on “Create Blank Device”. Give your device a name. Go to the Device Tags section. Add in the “particle_device_id” for key. For the value, enter in the Particle Device ID. 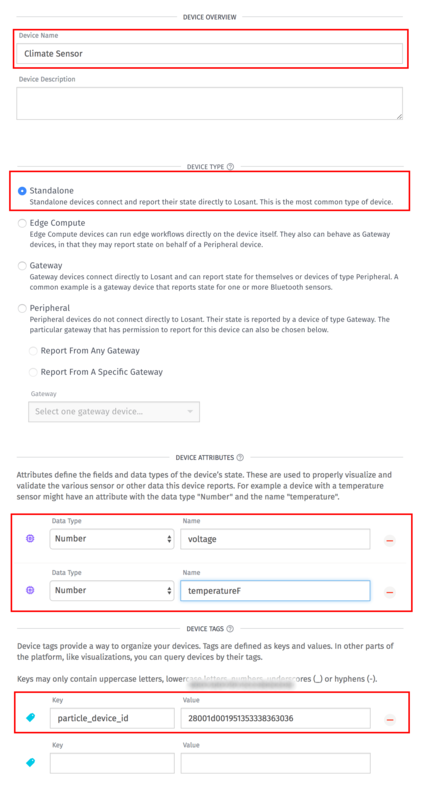 Notice in step 3, we are tagging the device with the “particle_device_id”. This is useful because we’ll use that tag to get the device and update its state. Now, go back to the workflow that you previously created. 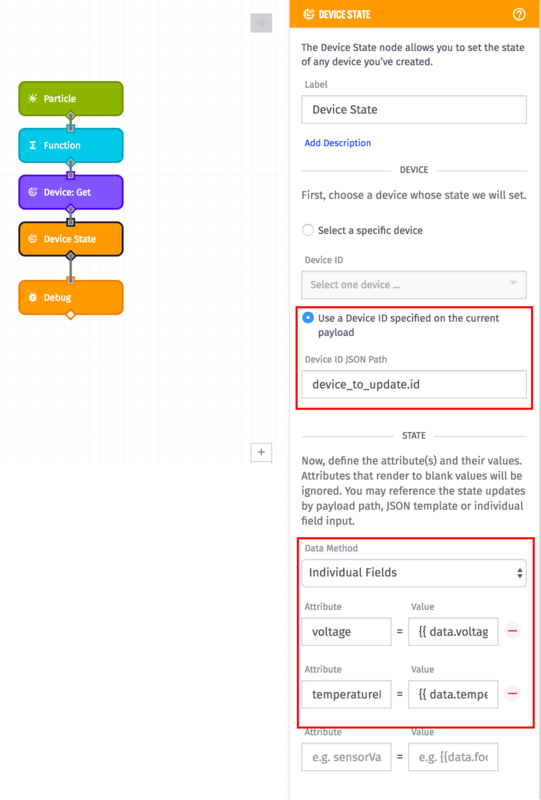 Drag the Device: Get node, and connect it to the Function node. 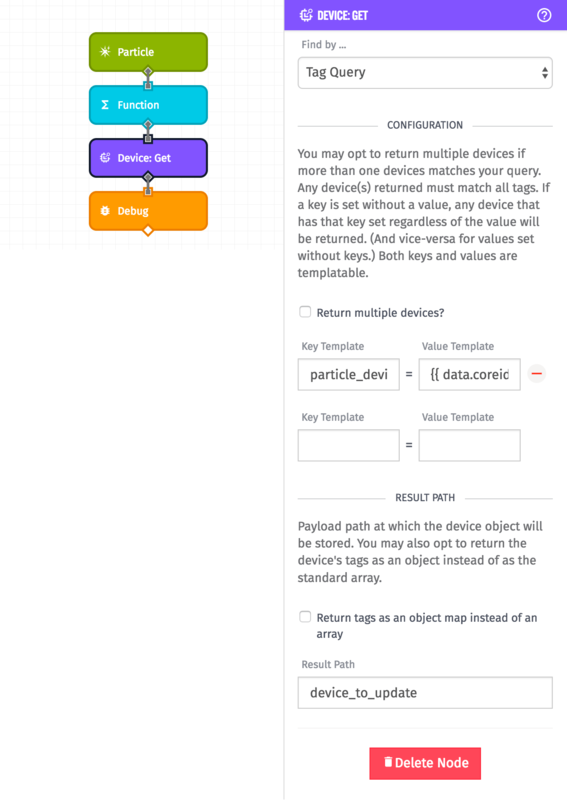 This will allow you to look up the device by the Particle Device ID, which comes from the payload. This will update the state of your device. 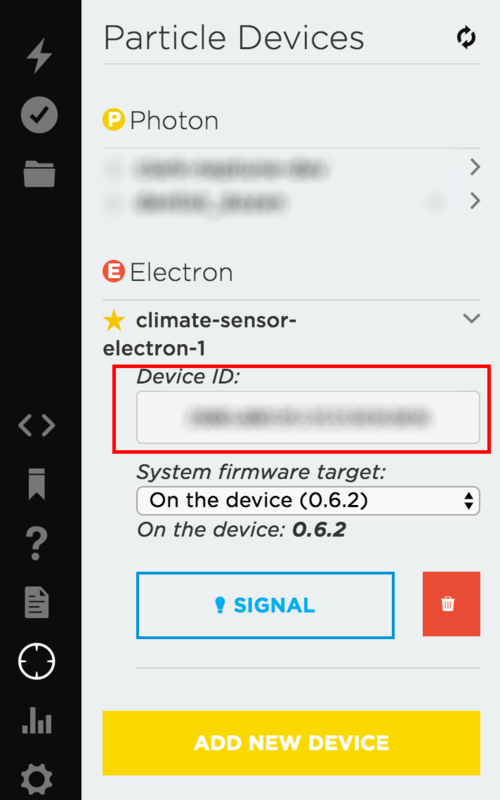 To test if your configuration is working, click on "Devices" -> "Climate Sensor" in the main application bar, then click on “Debug”. You should see a list of your most recent states under “Recent Device States”. This will turn the LED on after the text message is sent. Next, we’ll make the LED turn off after 5 seconds. 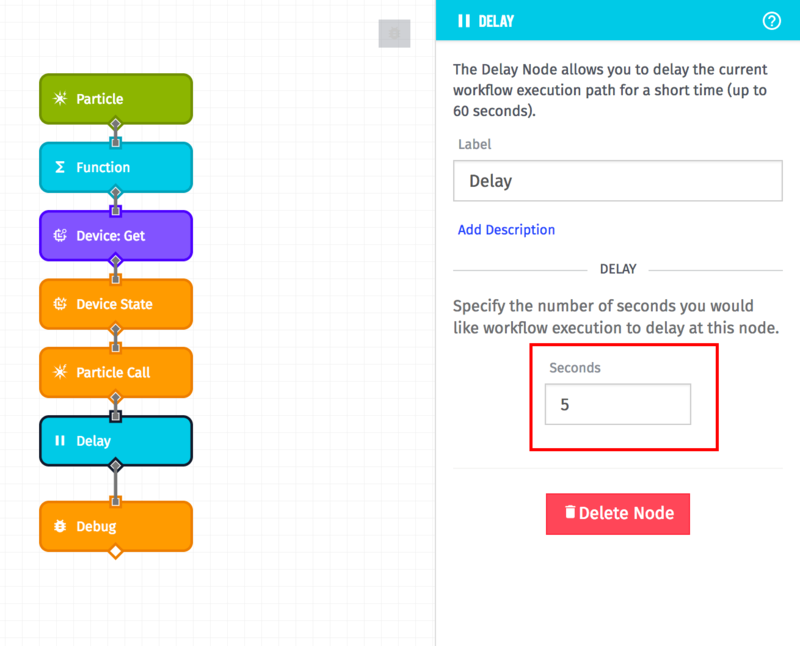 Drag the Delay node to canvas and connect it to the Particle Call Node. Set seconds to “5”. Now you can deploy your code and test again. To visualize the data, you can set up a dashboard. In the main platform navigation, go to “Dashboards” -> “Create Dashboard”. First, we’ll add a Time Series Graph to view when the door was opened and closed. 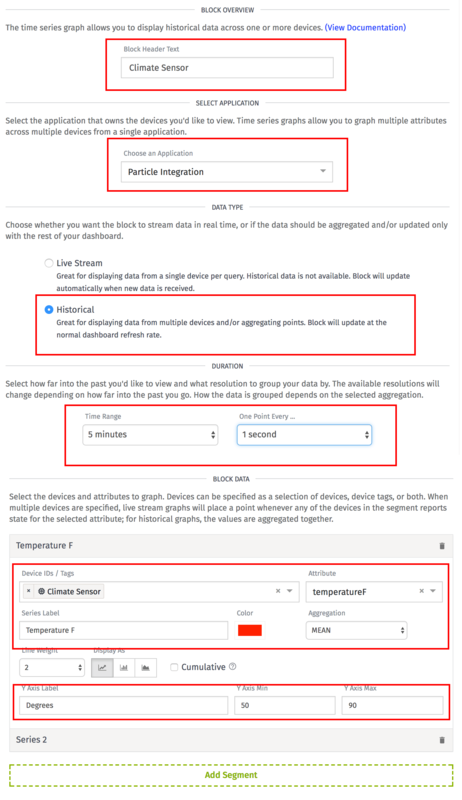 Locate the Time Series Graph block, and click “Customize”. If you want to chart the voltage, you can click “Add Segment” and follow the same steps for the voltage attribute. Next, we’ll add a Data Table block to view the logs. Click “Add Block” under the gear icon in the top right. Look for the “Data Table” block and click “Customize”. Go to the Configure Table, scroll down and click “Add Column” -> “Attribute”. Set the Source to “temperatureF”. Repeat those steps to add the “voltage” attribute, and click “Add Block”. Now, you’re set with a dashboard. These are all the essential building blocks to integrating a Particle application with the Losant IoT Platform. If you build something interesting, post it on our forums. If you have any questions/comments, please post them below. Losant is an enterprise IoT platform that makes it easy to build connected solutions that produce real-time results. Copyright © Losant IoT 2019, All Rights Reserved.